I received your letters - I'm glad you are well and not worried. Isn't the news about the great Rhine crossing fine? I think that this is the end for Germany, and that we shall be out of the devastating war soon. Our committee meetings are over - there were many problems. We are going to have to meet again on June 9 + 10 to discuss postwar fellowship applications. Moe's "President's Committee" has done a fine job - better than our Medical group, which hasn't tackled the problem right. 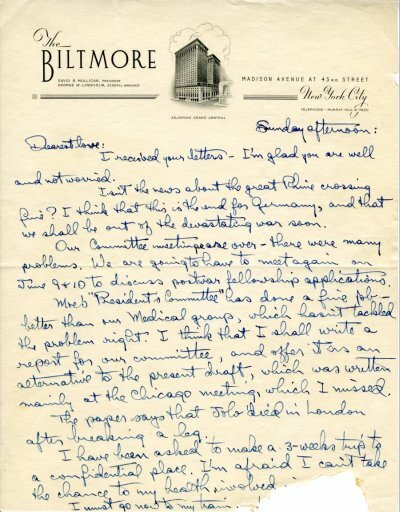 I think that I shall write a report for our committee, and offer it as an alternative to the present draft, which was written mainly at the Chicago meeting, which I missed. The paper says that Jolo died in London after breaking a leg.